There is hardly anyone more loyal than sports fans and that is why tickets for sporting events are sold in such big numbers. If you are a sports fan yourself from Salinas, then get ready for an action packed season. Sporting events like Monster Jam, PBR - Professional Bull Riders and Motul FIM Superbike World Championship will take place in Salinas this year and the excitement level is high among fans right now. You can now get your sports tickets at very good prices from our website. Watch sporting events in Salinas by getting 100% authentic tickets from our website. How much are Monster Jam Salinas Tickets? There are different prices for different seats. 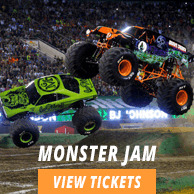 If you plan on watching your favorite sporting event live, then book your Monster Jam Salinas tickets now. Different sporting events like Monster Jam, PBR - Professional Bull Riders and Motul FIM Superbike World Championship among others will be held in Salinas at Salinas Sports Complex all through the year. Get your tickets now! Apart from Monster Jam, other sporting events like IndyCar Grand Prix of Monterey - Saturday Admission, IndyCar Grand Prix of Monterey - Friday Admission and IMSA WeatherTech SportsCar Championship - Saturday will also take place in Salinas this year. Get ready to be a part of an action packed season. The average Monster Jam Salinas tickets will cost you $76 for the event being held on 02/06/2019 at Salinas Sports Complex, Salinas, while minimum get in price is $35 on 02/06/2019.